Hindu pilgrims making an offering outside Rameswaram's Ramanathaswamy temple, just before sunrise. Most Hindus believe that Hanuman and his army of monkeys built a bridge from this point in India to Sri Lanka to retrieve the kidnapped bride of Rama. On the northern face of the Jaffna peninsula, near the now-deceased Tamil Tiger leader Velupilai Prabhakharan's house, a young Sri Lankan soldier guards one of many war-destroyed houses, now converted into makeshift guard shacks. With the conflict over, such outposts can be seen every 200 meters along the few roads that the public are allowed to travel along. At an orphanage for refugee children in Batticaloa. Some of the children reported having moved upto 13 times in the past four years. Near downtown Jaffna, locals construct a wood-shed in the remnants of war-destroyed housing. As new building materials are imported from the south, Jaffna is showing signs of development and new investments. Mine-clearance specialist in Mandaithivu, an island in the strait north of Jaffna. A victim of mine blasts in Jaffna, injured while visiting his sister. Mine clearance on Mandaithivu island, Northern Sri Lanka. Ms. S and her father, outside their house, a shelter for 2 families. This refugee camp in Batticaloa, Sri Lanka, was originally a transition point but now that the 300 odd refugees have settled for almost 2 years, they have chosen to stay in the area rather than return to their villages 80 km away. A toppled water tower in downtown Kilinochchi, once the Tamil Tigers administrative center. The Sri Lankan army and the Tigers accuse each other of destroying the tower. Compared to the rich gem-mining and rubber-production industries elsewhere in Sri Lanka, the decades of war have left Tamils in the north with few viable industries, such that many migrate for work, such as during rice harvest seasons. The principles of Tamil nationalism Prabhakharan espoused still hold sway for a number of supporters, as evidenced by this political party billboard near Thanjavur, Tamil Nadu. 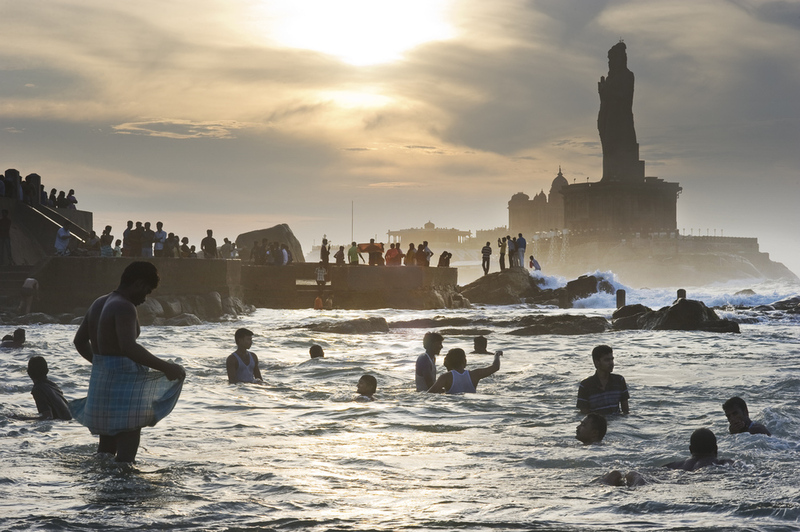 Indian pilgrims visiting Kanyakumari, India's southernmost tip, take a holy dip at sunrise. The site's holiness is compounded by a major island-shrine to Swami Vivekananda, 'the maker of modern India;' the statue of Thiruvallur, the Tamil's poet-philosopher; and a key temple for the Hindu faith. As one pilgrim explained to me, "How can we pay our respects to Mother India, if we do not come to this point to touch her feet?" Pilgrims visiting Nagadeepa, an island north of Jaffna in the Palk strait, said to be Buddha's first landing point on the way to Sri Lanka. As the island was off-limits for much of the civil war, many of the older pilgrims are visiting for the first time in 20-30 years. 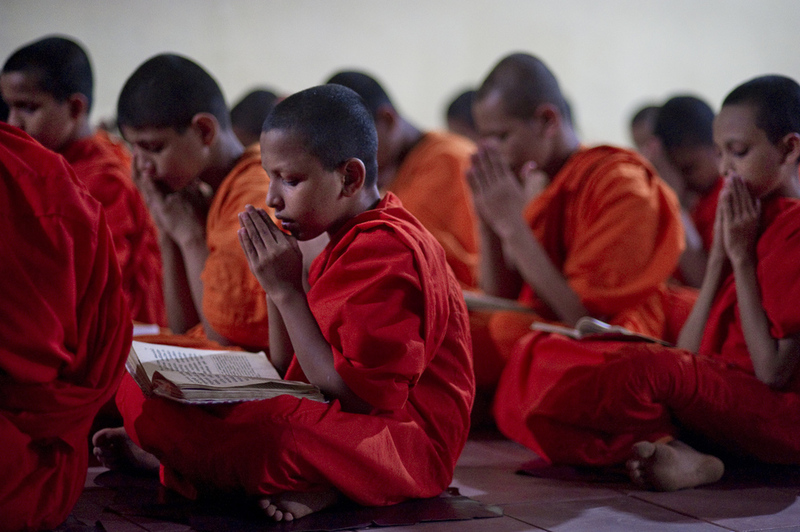 Young monks meditate in an evening session in a Astgiriya monastery in Kandy. The youngest monk is 9 years old. 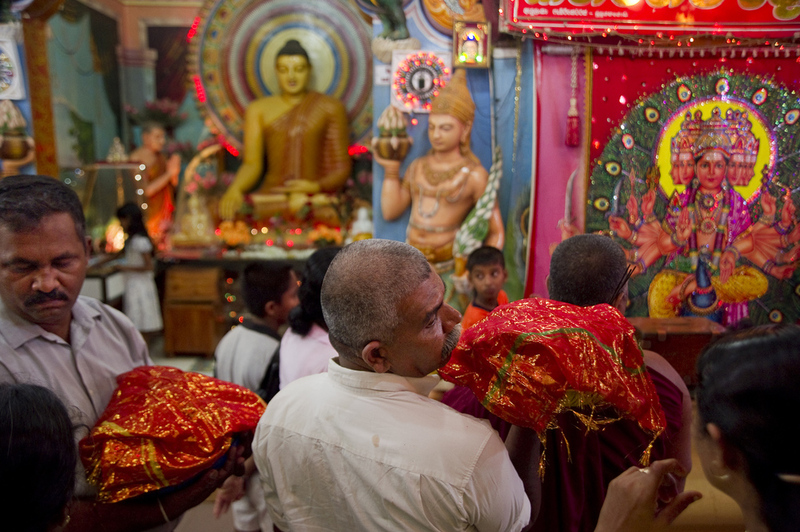 Pilgrims with offerings in Kataragama, Sri Lanka simultaneously worship Buddha and Lord Murugan, a Hindu god. The temple town is a regionally popular place of pilgrimage of Hindu, Buddhist, Muslim and indigenous Vedda communities of Sri Lanka and South India, where the god Muruga is the main deity. Pilgrims carrying offerings to the top of Adam's peak, a holy site for Sri Lankans of all faiths. While Buddhists believe the rock to be imprinted with the Buddha's footprint, Christians consider the footprint to be of St. Thomas and Muslims see it as Adam's first step outside of paradise. With the rock visible from sea and visited early on by the likes of Marco Polo and Ibn Battuta, the peak has near mythic status for Sri Lankans. Veddahs in central Sri Lanka, the island's earliest inhabitants, caring for a pet monkey that they adopted after its abandonment. Traditionally from a hunter-gatherer lifestyle, the Veddahs have lost the ability to follow their way of life due to shrinking forests, restrictions on their hunting grounds and lack of communal cohesion. Against the backdrop of rail and road bridges leaving the mainland to the island of Rameswaram, a diver mans his boat out to search for sea treasures. While Rameswaram was once famed for its exceptional pearls, these divers now mainly search for souvenir shells and coins cast off the bridges by Hindu pilgrims who believe in the good luck this brings on their way to a holy land. Thunderstorm clouds over a fishing village on Rameswaram island in the Palk strait. 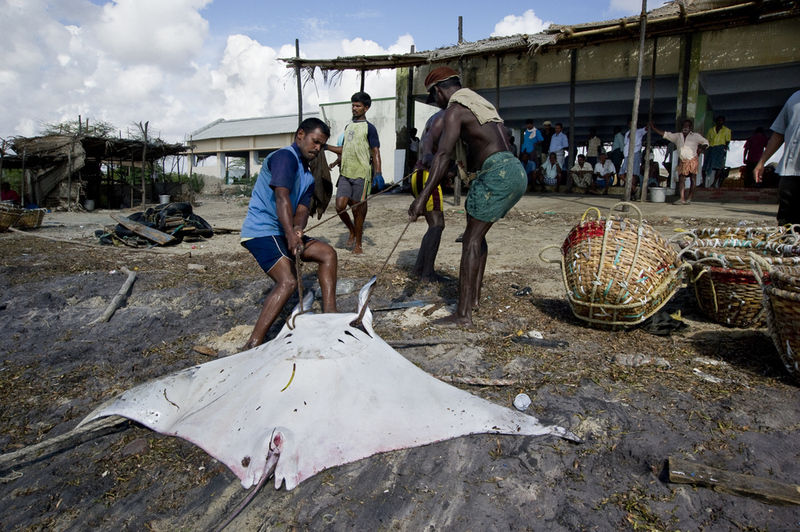 Fishermen at Tharavaikullam, a fishing harbor near Tuticorin, one of the largest sea ports on the Palk strait hauling in a manta ray. The Gulf of Mannar is one of the most ecologically diverse marine areas of India's coast, yet without regulation or viable career choices for fishermen, destructive fishing of endangered or critical species remains largely unchecked. Fishermen at Tharavaikullam, a fishing harbor near Tuticorin, one of the largest sea ports on the Palk strait, preparing ice for a fishing haul. The Gulf of Mannar is one of the most ecologically diverse marine areas of India's coast, yet without regulation or viable career choices for fishermen, destructive fishing of endangered or critical species remains largely unchecked. Schoolgirls in Colombo take in a sunset, looking across the Palk strait to India.